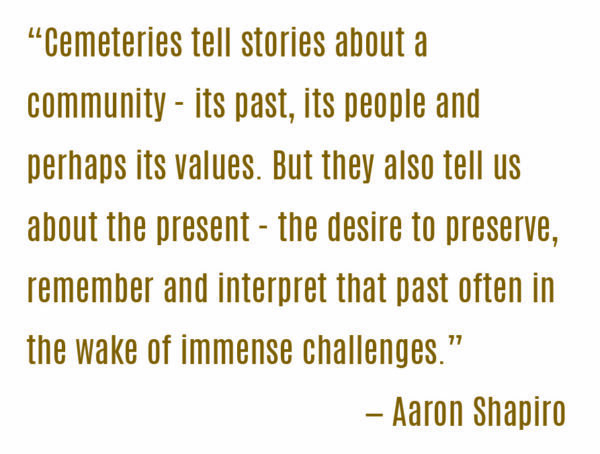 UNC Charlotte historian Aaron Shapiro thinks deeply about the impact of society’s resting places and the importance of protecting and understanding them. In his co-teaching of a history class called “Preserving Memory in the Digital Age,” Shapiro strives to help students broaden their perspectives on cemeteries and their surrounding communities, through in-depth research and class work. As the cornerstone of the class, the students traveled to Poland in late May to do stabilization, preservation and interpretive work at cemetery sites. 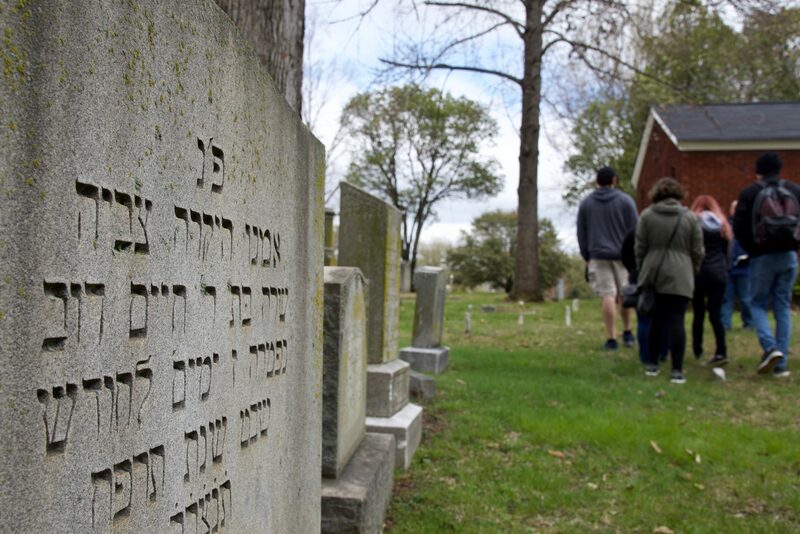 Many Jewish cemeteries in Eastern Europe remain under constant threat due to neglect and lack of awareness about their presence and condition. 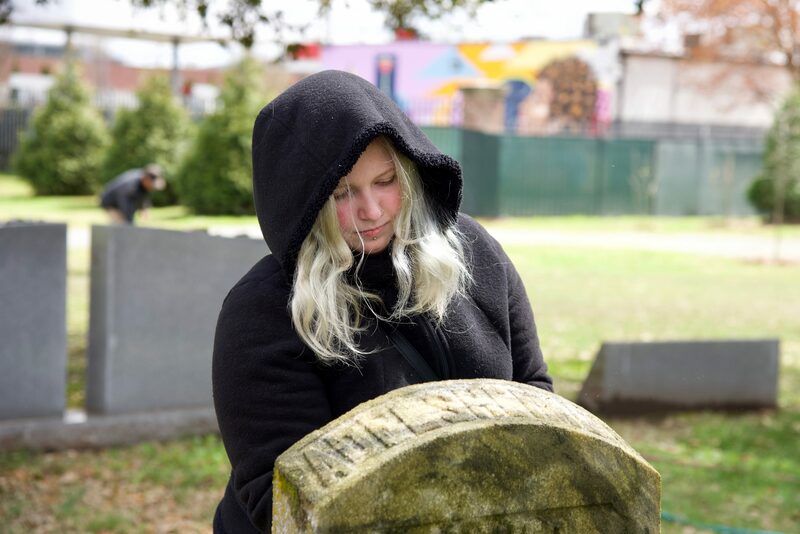 Erin Robinson cleans a gravestone at the Hebrew Cemetery. Shapiro and Talli Dippold, assistant director of the Stan Greenspon Center for Peace and Social Justice and Director of Jewish Life at Queens University of Charlotte, have taught this course as a team, with students enrolled from both universities. numerous museums and world heritage sites, as they explored how historians address commemoration and memorialization. The project immerses students in public history and offers an opportunity to consider how historians partner with the public, engage questions of memory and develop material for public audiences using new digital tools. The work helps students learn what it means to be global citizens and to be aware of the world around them and their role within the world, Robinson says. “If tragedies like genocides are forgotten, it has the negative effects of erasing a people’s contributions to society, it delays the pursuit of justice for crimes against a people, it plunges a people into further victimhood,” she says. The hope is that the program will have a lasting impact not only on the students, but also for the people who live in the communities they are visiting. While the work holds the potential for broad impact, it also has affected students in a more intimate way. For Michael Farrell, a math major at Queens University, the class prompted conversations with his grandfather about his family’s history. Members of the family had immigrated to the United States from Russia, Ukraine and Poland. After the Holocaust, his family did what they could to help other Jewish people. Farrell initially was unsure he would find the class particularly relevant to his future career teaching math. Yet, he has found meaning in what he is studying. He says he will take this realization into his classroom when he becomes a math teacher and is faced with students who question the relevance of math. “By applying this, I can try to provide them with an understanding of why they are learning math and hopefully make sure they are getting something out of it,” he says. 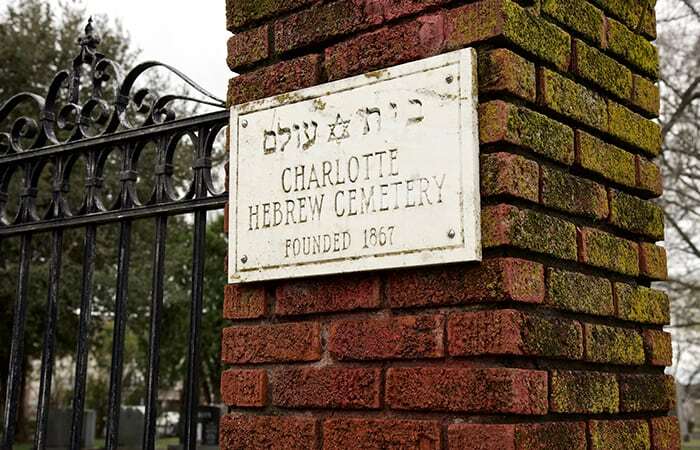 Students visited the Hebrew Cemetery of Charlotte. During their study abroad trip, students have kept journals, documenting their academic learning and their personal observations. They are using these as one resource for sharing their findings with people in Poland and in Charlotte. To help the students with this project, organizers reached out to Anna Brzyska, who had previously done work in Brzesko, working with the mayor and other local officials of Brzesko. Preserving Memory in a Digital Age received support from the Blumenthal Foundation, the Jewish Federation of Greater Charlotte, private donors, Anna Brzyska, and the mayor and local people of Brzesko.